President-elect Donald Trump has often claimed climate change is a hoax. The man he selected to lead the transition for the Environmental Protection Agency and shape climate policy for the next administration is like-minded. Trump adviser Myron Ebell, trained in philosophy and politics, has spent his career trying to create political uncertainty about the scientific consensus on climate change and preserve the status quo for the fossil fuel industry. From his perch in Washington, D.C., at the Competitive Enterprise Institute, Ebell says the climatic changes taking place in Alaska are no cause for concern. “I don’t think that we can put the finger on global warming,” Ebell said during a public radio panel discussion a year ago, referring to why numerous environmental alterations are taking place in Alaska. That discussion was timed to coincide with what Ebell called President Barack Obama’s “insulting tour of Alaska” at which the president gave a “disgraceful speech” in Anchorage about the need to act on climate change. Ebell denies the science. The changes in the Arctic are simply a natural cycle, and there is no reason to slow the development of oil, gas and coal in Alaska or anywhere else, according to him. I heard a far more authoritative account of the situation Monday from three highly regarded Alaska scientists who have spent decades studying these complex matters. At a public meeting on permafrost sponsored by the Arctic Institute of North America, they said that the best climate models show the world is heating up, which means more wildfires, erosion and a continuing meltdown of the permafrost, which will make soils more unstable in the decades ahead. I asked them what they thought of Ebell’s declaration the so-called “Pacific Decadal Oscillation” is all the explanation anyone needs for rising temperatures in Alaska. The term refers to variations every two to three decades in the temperature of the Pacific Ocean. “Nobody denies that there is some natural cyclical changes in climate,” said Vladimir Romanovsky, a professor of geophysics at the University of Alaska Fairbanks. But he said there is a long-term warming trend taking place that goes beyond natural variability, which is obvious in the northern regions to anyone who can read air temperature graphs. Terry Chapin, a professor emeritus of ecology at the University of Alaska Fairbanks, agreed. “The warming has persisted through highs and lows in the Pacific Decadal Oscillation, so that in itself can’t explain things like this,” said Chapin. “But maybe more fundamentally for somebody who might be involved in government leadership, we can’t do anything about actual cycles, but we can do something about the anthropogenic dimension of warming. So it seems like that’s where society’s responsibility needs to be,” he said. By the end of this century the coolest years are likely to be comparable to the warmest years historically in Alaska, he said. 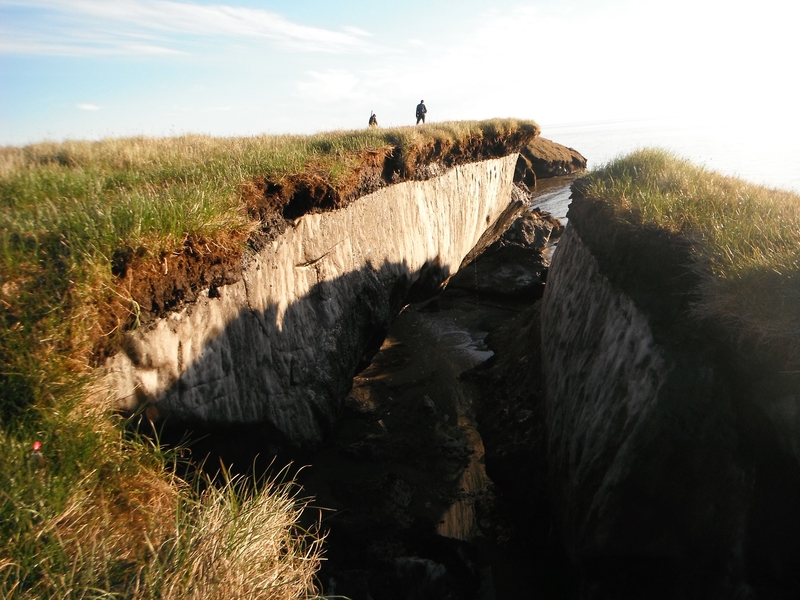 “We’ve crossed some thresholds,” said Torre Jorgenson, past president of the U.S. Permafrost Association. He referred to photos earlier in the presentation that showed degrading ice wedges formed up to 5,000 years ago. “They successfully persisted over these smaller climate fluctuations over thousands of years,” he said. There are many spots in the Arctic National Wildlife Refuge and the National Petroleum Reserve-Alaska where ice wedges are melting and the surface above collapses with the thaw, he said. Also on Monday, the World Meteorological Organization said 2016 is likely to be the warmest on record, surpassing 2015, which had been the warmest year on record. In the first nine months of the year, the WMO said Alaska temperatures hit record highs, about 2.34 degrees above the previous mark. Across the Arctic, temperatures were about 5.4 degrees above average, it said. “We are used to measuring temperature records in fractions of a degree, and so this is different,” said meteorologist and WMO Secretary-General Petteri Taalas in a prepared statement. “Atmospheric concentrations of major greenhouse gases continue to increase and reached the highest levels in the instrumental record. Arctic sea ice remained at very low levels and there was significant melting of continental ice on Greenland,” the WMO said. The WMO statement was timed to provide information to a United Nations Climate Change Conference in Morocco, part of an international effort that Trump has disavowed. Far from being a hoax, the climate models and the results of decades of research, including the work by many of Alaska’s leading scientists, point to the urgency of the issue and the foolishness of trying to deny what’s happening.